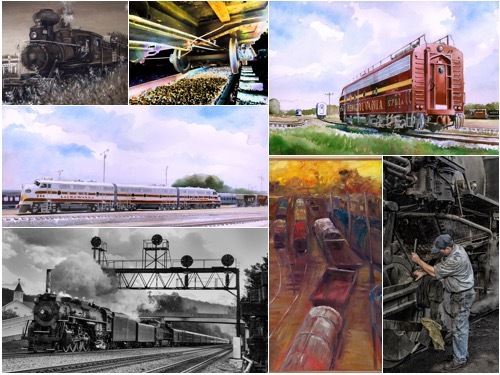 The Berkeley Arts Council announces the accepted artists for “Heavy Metal”, a national juried exhibit of railroad art. The juror was Michael Doig of Davis and Elkins College in Elkins, West Virginia. The exhibit will be on display in the Berkeley Art Works in Martinsburg, WV. The exhibit presents a wide wide range of media and techniques that celebrates the diverse rail heritage in the United States. In his juror’s statement, Michael wrote “As I look at each piece of Artwork, I imagine the work that went into it, I think about the training that it took to create the piece, and as an artist myself, I think about the obstacles that occur in our lives that compete for our attention. Each piece of Artwork is, in many ways, miraculous. Each artist has beaten the odds in making their work. And my task is to callously decide which piece is best.” He selected 37 works out of 91 submitted. 37 artists from 15 states will be represented in the exhibit. A full list if the accepted artists is at http://artworks.berkeleyartswv.org/hmetal/. The exhibit will be on display from August 31 through October 1. There will be a reception and awards presentation Friday, September 9 from 5-7pm. The reception is free and open to the public. Gallery hours are Wed-Thu 11-5, Fri 11-8, and Sat 11-4.